Etat Pur is a French online company that was laucnhed a couple of year ago, introducing a brand new concept in skincare. Their creator, Jean-Noël Thorel, is actually the pharmacist behind the creation of Bioderma and Esthederm - brands that I don't need to introduce to you anymore. So that's definitely an encouraging sign when it comes to the quality of Etat Pur's proposition. According to your skin needs, you will pick and combine products from both ranges. What I have used, though, are the pure Actives. These are in fact the well-known ingredients that make skincare efficient, but presented in a pure form and a high concentration. You are supposed to use those where and when needed, on top of your usual skincare routine. For example, you can use pure salicilic acid in different concentrations if you suffer from blackheads or blemishes. You could use PP vitamin on very damaged skin. You could use Citric Acid and AHA on dull skin... 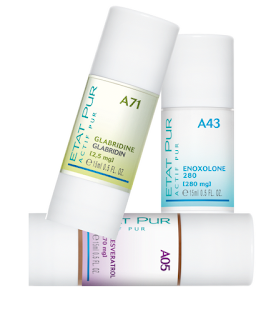 The Etat Pur website will guide you and help you make a full diagnostic of your skin condition so you know what products to use in both the A and B ranges. The products are very efficient, easy to use and - cherry on the cake - priced in a very accessible way! I am currently using their Hyaluronic Acid in lieu of daily moisturizer. The little bottles are very easy to use, they are conceive to deliver one drop at once under pressure of their bottom part, so there's no waste going on at all and there is no hygiene issue. I find it really interesting to be able to pick pure actives, I think it's something that was really missing on the market for anyone who has a bit of knowledge of skincare and wants to go one step further than the pre-made recipes of existing cosmetic ranges. We are all different and the ability to custom mix and match according to your needs can really benefit us, providing we do our research before using random actives, of course! Until recently Etat Pur was available in France only, but they have now opened e-stores in other European countries like the UK, Germany and most of Western Europe. If they are available where you live, I definitely recommend checking them. Maybe there's something great in there to boost up your skin routine a little.